The Drive to Prop is by "V" DRIVE. The hull was surveyed for insurance purposes earlier this year. The Fairey marine company was synonymous with inventive and enduring design. Our Boat , number 698 came off the production line in 1980. She is one of only seven boats produced and of those seven it is believed only three survive. She has the stamp of a utility vessel, produced to do a job of work in exacting and demanding conditions. 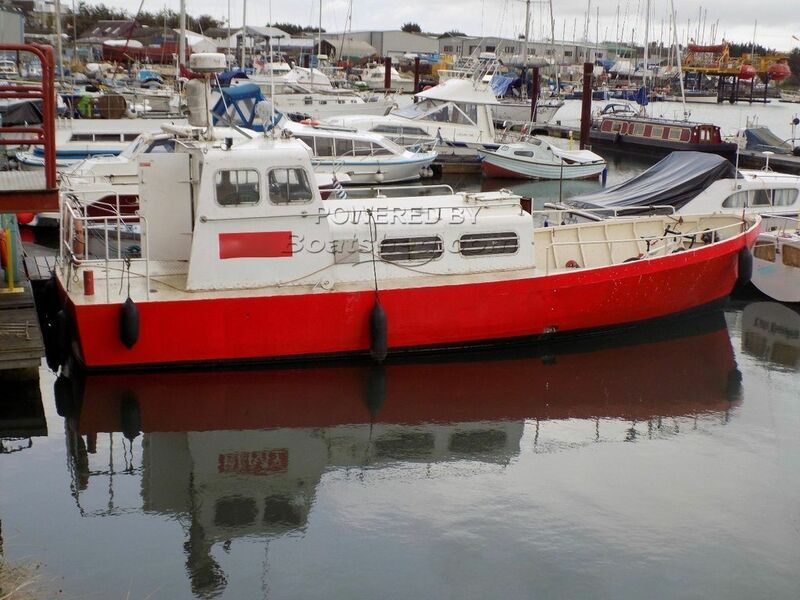 With her excellent helming wheelhouse, safety bulkheads and generous working areas, and a well protected accommodation area she is suitable for a wide range of tasking. Diveboat, work launch, Sea Fishing etc. This is a serious boat and coupled with her unmatched power plant and many utility features she will be an excellent investment and a great asset whatever your application. And it has to be said a significantly historic vessel, certified as such she demands attention wherever she operates. The current owner has completed considerable renovation but has left her intact, preferring the utility styling. She is ready for duty, wherever she is called. This Fairey Launch Capable And Rugged has been personally photographed and viewed by Geoff Jaquest/Phil Berkeley of Boatshed Suffolk. Click here for contact details.